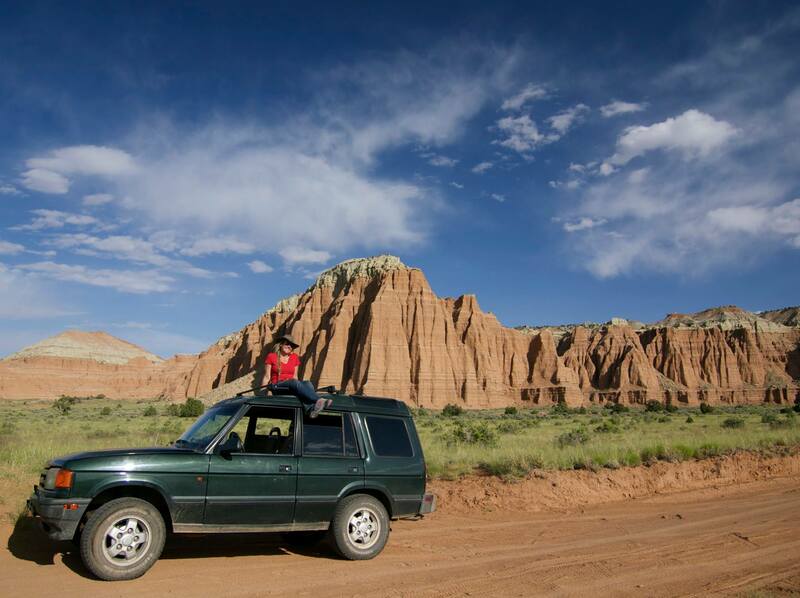 Two summers ago, stuck in Crested Butte, Colorado with my trailer, two dogs and a dying Subaru, I searched Craigslist on a whim for my dream car: an older Land Rover Discovery. A rare 5-speed manual popped up for sale in Colorado Springs, and I limped my rig over the mountains to buy it outright, in cash. My ’96 Disco was not without flaws – it stranded me three times in the first month I owned it – but over the last two years and 60,000 miles it took extraordinarily good care of me, my dogs and my trailer, with a good chunk of those miles over the kind of terrain Land Rovers are made to drive. A week ago, I was driving down the mountain – without the trailer – when the Rover’s back right tire blew, sending us careening out of control and then rolling roof over wheels down the mountain. After three rotations we came to rest on our wheels right next to some electrical boxes, engine still running, music still playing. I shut the Rover off, shouldered my way out of the rig and got the dogs clear of the wreck. Miraculously, save for a small scratch under Dio’s left eye, we were all completely unscathed. In the end, the Rover took all the hits for us. This makes for a better story. I’ve been moving through the stages of grief ever since, missing my rolling home on the road, but mostly I feel incredibly, unbelievably fortunate that my dogs and I walked away. It was the perfect wreck. All those rocks and dinosaurs and that solid brass owl flying around inside with us – nothing hit me. 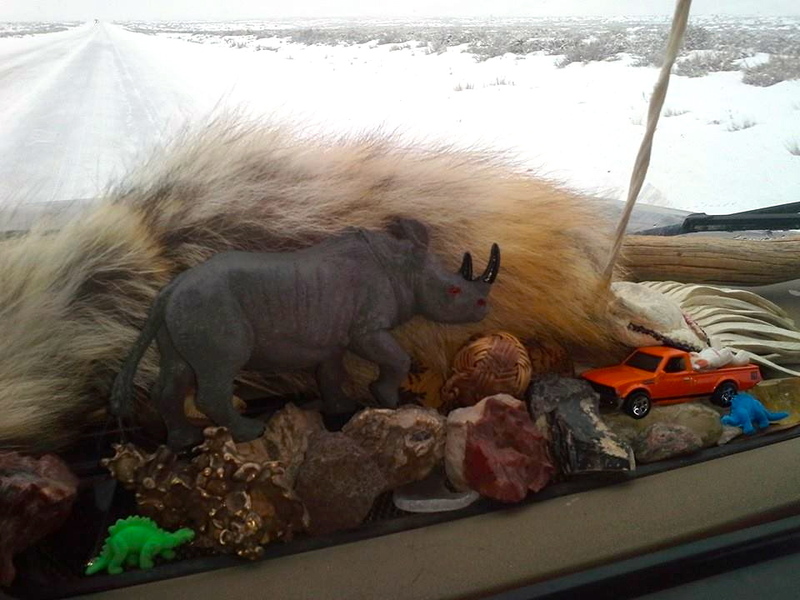 The medicine bag an Oglala Lakota woman had given me “to keep me company and keep me safe” on my travels was still dangling from the rear view mirror stem, though the mirror lay broken on the side of the road. I’m not sure yet what my next ride will be. A huge part of me wants to get another Land Rover. But the rest knows I should move forward, on to the next dream. Onward and upward, thanks to the Rover. It will always be my dream car. Our last road trip in April through Utah’s 9-mile canyon. The tire could have blown here, hitched up, in the middle of nowhere, but it didn’t. It blew in the best possible circumstances. Thanks, Rover. In honor of the Rover, reread some of the adventures we had: Rover Love, Wheeler Geologic Area, and Between a Rover and a Hard Place. 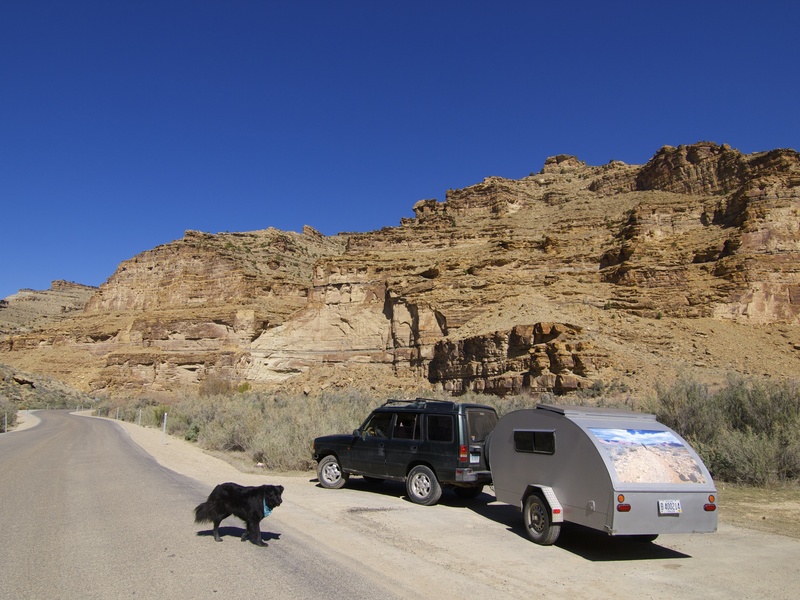 This entry was posted in Bowie & D.O.G., Road tripping!, Teardrop Trailer, Uncategorized and tagged Land Rover Discovery. Bookmark the permalink. glad you made it unscathed. that story will keep me aware when driving down any future mountain. So thankful that you and the dogs were safe. What a traumatic adventure but one you lived to tell. We’re sending good karma your way in hopes that you can continue with your travels and writing. I am so happy that you and your companions survived that accident without being seriously injured. Please be careful on your future adventures and travels. What an awful experience! So good to hear that the 3 of you are safe. So glad you and the dogs are ok! That was one sturdy vehicle! Sometimes even when an event is not pleasant, the universe somehow takes care of us to insure the best possible outcome to a possible tragedy. Good luck on finding your next ride. Honestly, you are watched over. Good Karma? Jesus? Medicine bag? Who knows. So glad you and the beloved pups were not injured!!! Wow. So glad that you and the pups are ok. Good you didn’t have the teardrop with you – hate to think what would have happened to it. Best of luck finding the new ride. That is some harrowing experience! Glad you and the dogs made it out with only a few scratches. Yes, you are watched over. You have many more things to experience and do in life. The Universe is not done with you, yet! Glad to know you and your dogs were unharmed. Good luck with your new home on wheels. How about an RV? rock n roll. so glad you are all safe!!! Glad you’re safe. Don’t forget the medicine bag for your next ride! How terrifying!! Having a tire blow on the road is one of my biggest fears. What do you think caused the blow out? 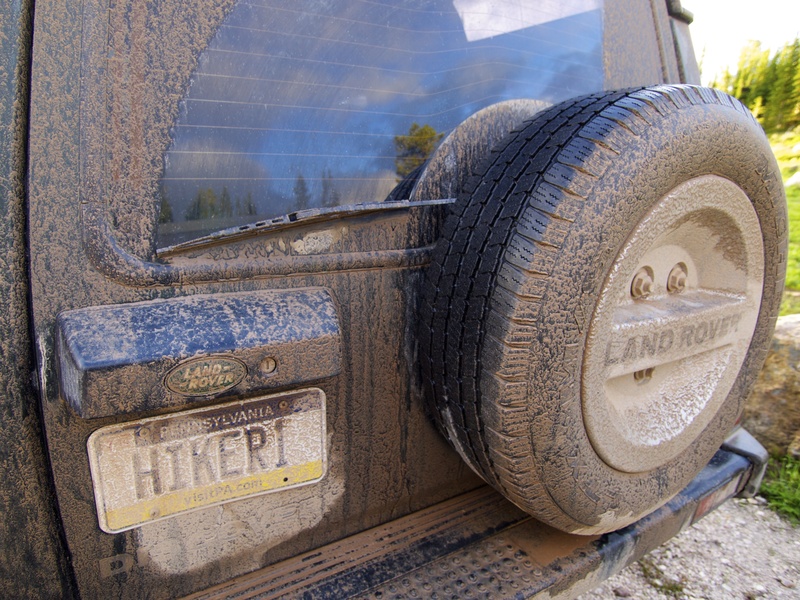 How old were your tires? What brand? I got all new tires last summer. I’ve driven a lot of rough roads since then and it wouldn’t surprise me if there was a rock puncture weakness. I have to say that being looked after had nothing to do with the outcome of this accident. If she was being looked over and protected, whatever or whoever was looking out for her and her dogs wouldn’t have let the tire blow out in the first place to destroy her vehicle. Her seatbelt and just plain old cirmstances is what saved her. Same for her companions, except leaving out the seatbelt aspect. Plus, the vehicle and its well made passenger cage had to have offered a lot of protection. The vehicle manufacturer should be the one being thanked for the outcome of this. Wow…”Someone” was certainly looking after all of you! So glad to hear everyone’s OK. Rover sure did his/her job too. RIP. May I recommend a Jeep Wrangler as a possible replacement? The off/rough road capability and the convertible/removeable tops are great! Glad you came through without any serious injury. As far as next vehicles go, i have to plug my own ride which is a 97 tacoma. It has kept me rolling down the adventure highway now for a bit over 308,000 miles. Im hoping for at least 400k. In a few months i may have to put in a clutch, that 308 k is on the original. Glad everyone came out okay! You know you owe your parents a big hug when you see them again. You are still their baby girl! I am guessing that you did go to a hospital or Dr to have yourself checked out just to make sure that you have no internal or unnoticed damage. Sometimes even though we feel alright after an accident there can be unnoticed problems that can only be found by a Dr, and or certain tests. You had a very violent accident and the stresses that your body experienced could have caused some damage. It might not be a problem now, but in later years can show up if it was not discovered early right after the accident. Nah the paramedics checked me out on the side of the road and gave me a clean bill of health. Told me to call them if I felt weird or worse. I was really completely unscathed. No neck or back pain or anything. I did get the dogs checked out by the vet. He thought Bowie might have twisted his back a little bit and gave him a steroid shot to help with any pain or swelling. He’s been fine since, romping and wrestling as usual. We’re all very fortunate. I’m sorry about the Rover, but glad you and te dogd walked away safe. I’m sorry about the Rover but glad you and the dogs walked away safe. My wife forwards your postings to me and we enjoy following your travels with the dogs. The steveguy is right; the paramedics should have recommended an MRI right away and your dismissive tone may come back to bite you someday. Ya just don’t know. This incident may be some kind of nudge by the highway goddess to give up your vagabond life, settle into a real job doing some kind of field work for an earth sciences dept. in higher education somewhere, and begin accruing points/benefits for your retirement someday. Maybe even the usgs if you’re not averse to the corporate mindset, which all evidence we gather from your postings, you most likely are. I have an idea about the san jacinto fault broadband seismic monitoring stations (one such installation resides in my backyard up here in idyllwild) you may want to write about for perhaps geotimes; contact me by email. (We just had two seismic shakers last nite). Lastly, I would ditch the teardrop and invest in a camper van of some sort. Towing trailers is perilous and you can only drive 55 on most highways. What Mary is doing is REAL, and she IS retired doing what she loves. I am in the process of doing what she is doing. And can’t wait to be out there also. Who wants to drive 55……45 or less is more my style, off the highways. And Mary….please don’t sell your cool, cool trailer. So glad to here that you are ok! Wishing you luck with finding your new wheels! Glad to hear that you and the dogs survived such an ordeal. I agree with the person who thought your parents might need a hug, too. So glad to read that all turned out for you and your dogs. 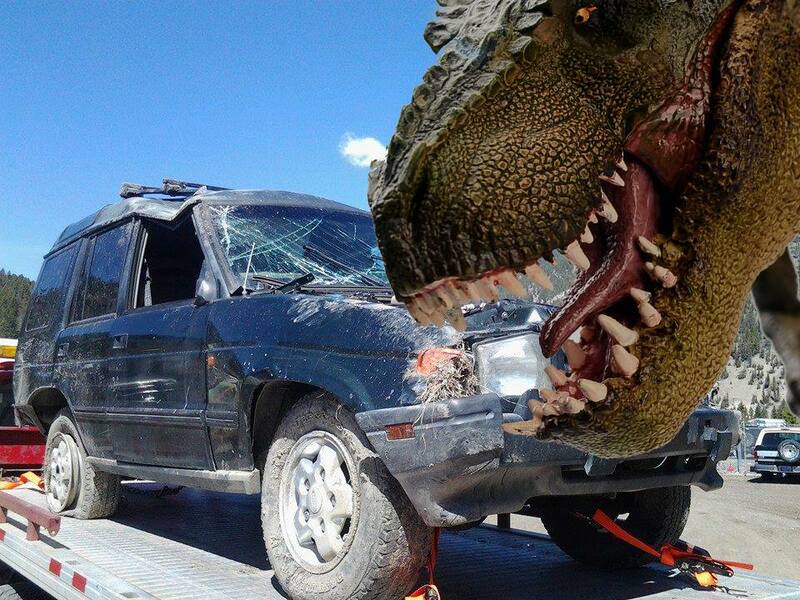 And yes, the T. rex adds much more to the story! Sad to hear of it’s demise but at least no one was seriously hurt. Best of luck finding a good replacement. Firstly, I am so glad you and the dogs are okay. Secondly, I know what it’s like to walk away from a dream car because the thing was crushed to death while saving you. It was REALLY REALLY hard for me, and despite driving what I now call “my dream car”…the truth is that my 2003 yellow VW bug–Miss Daisy–will always be my dream car, RIP. Mary I’m glad to hear that you and the dogs are OK and continuing to do what makes you happy. Among airplane drivers, there’s an expression; “A good landing is one that you can walk away from. A great landing is one that allows you to reuse the aircraft.” Congratulations on making a good landing. Not a good habit to get into, though. I’m also glad you and yours are OK.
Wow what a story….the Rover sure performed in the extreme that most of us will never experiance! Hope you and the dogs are well. Havn’t seen a post in a month. Well I’m reading this news three months late – glad you were all ok Mary… well done British engineering! !